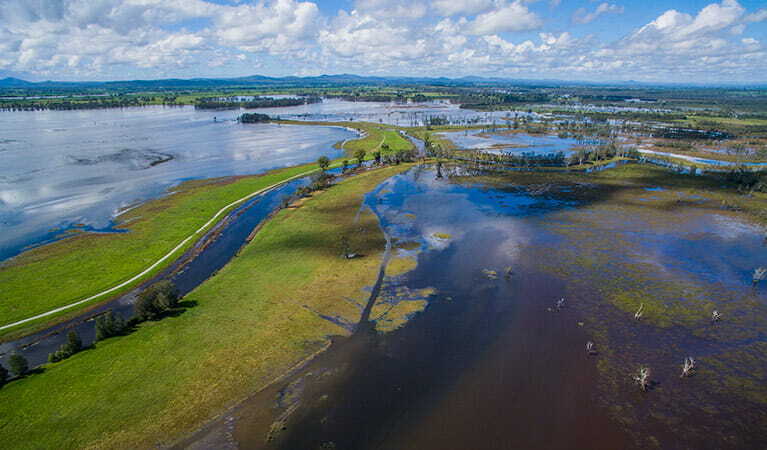 Everlasting Swamp National Park is a rare coastal wetland north of Grafton in the Clarence Valley. 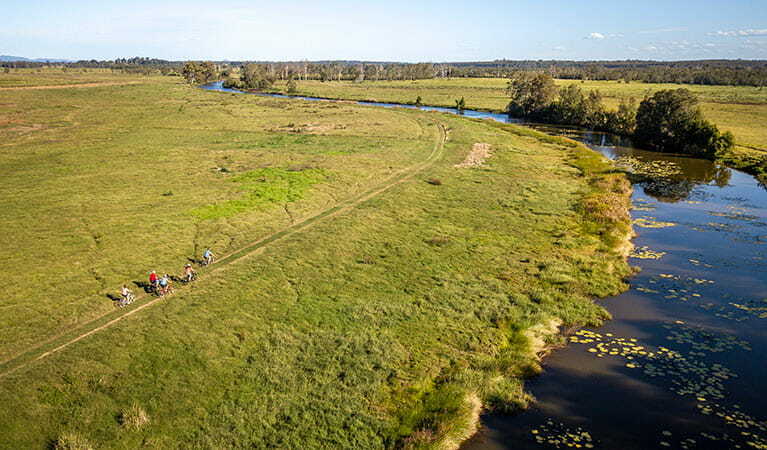 A hotspot for bird watching, you can explore the park and its wildlife from your canoe or bike. 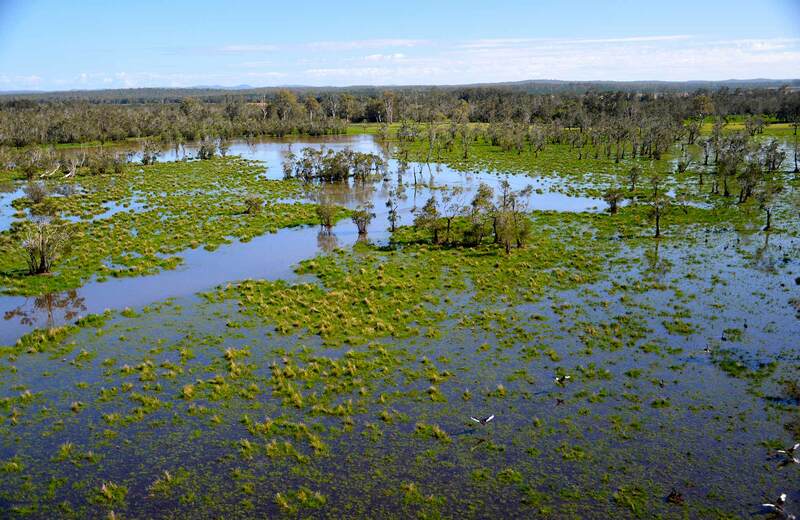 Known to bird watchers as the ‘Kakadu of the south’, Everlasting Swamp National Park is one of the largest freshwater wetlands on the NSW North Coast and protects 26 threatened species. Take your binoculars because this park is superb for bird watching—especially after heavy rain when high water levels attract birdlife. 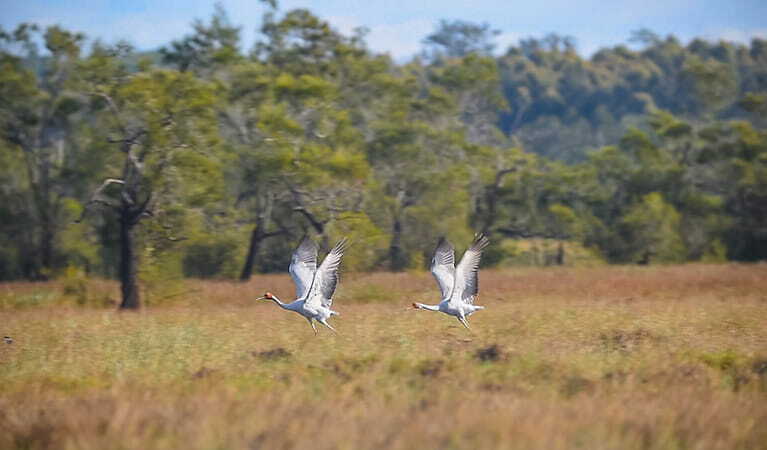 You’ll be thrilled to discover rare birds and even glimpse their courtship dances. 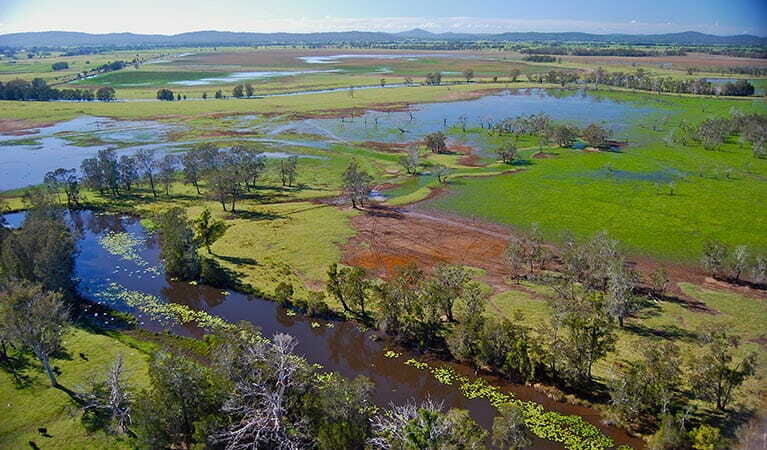 Keep an eye out for black-necked storks in their huge stick nests, elegant brolgas bobbing and strutting with life-long mates, and black swans escorting their downy cygnets through the wetlands. Jump in your canoe or kayak to paddle the meandering creeks lined with reeds and giant waterlilies. Bring your fishing rod to cast a line for bass and mullet in Sportmans Creek or explore its wooded creek banks by bike. 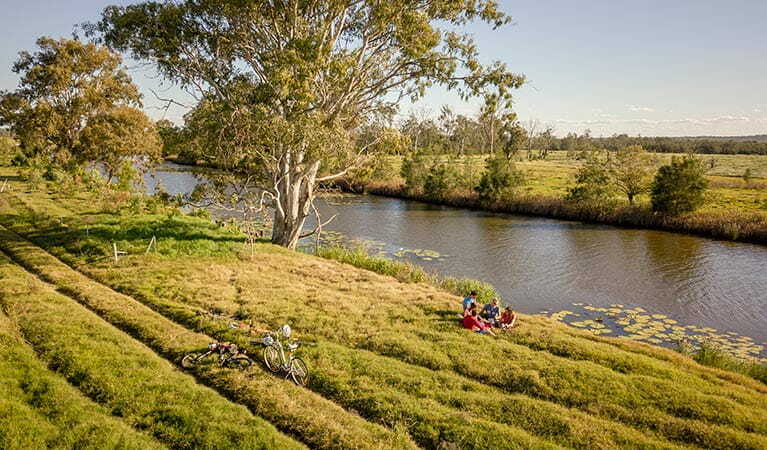 If you’ve come to relax away from the crowds, picnic on the grass beneath the shade of old red gum trees as frogs croak and birds of prey circle overhead. Download the app and bring the wildlife and history of this vast wetland to life. 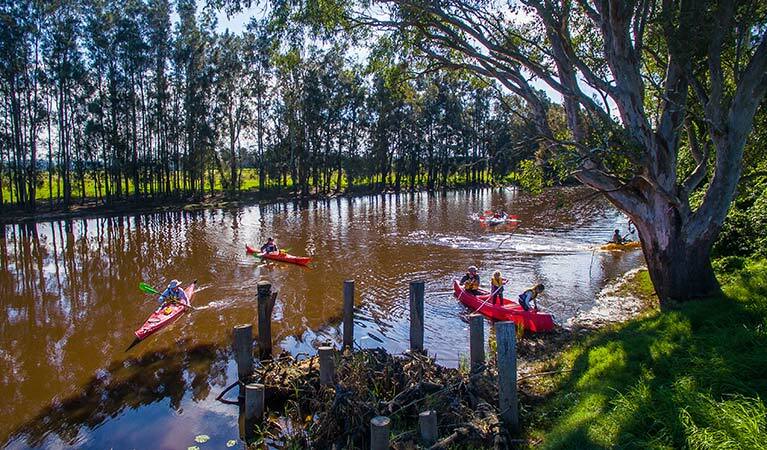 Enjoy the thrill of spotting brolgas or black-necked storks as you kayak along Sportsmans Creek, or cycle beside Woody and Reedy creeks. 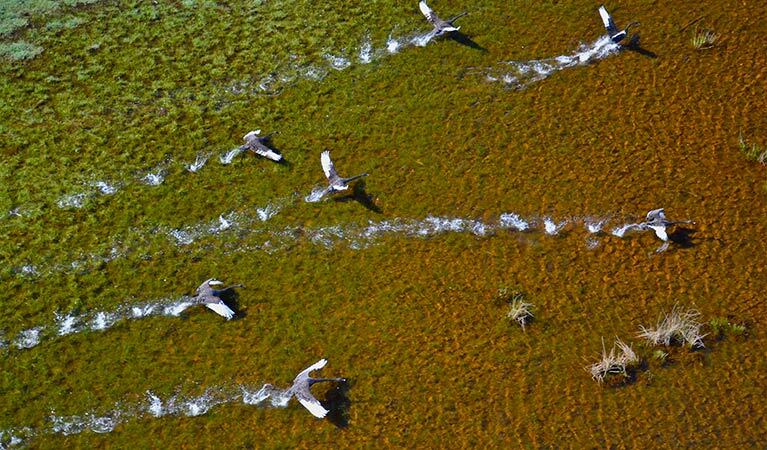 Listen to bird calls and learn more about these important floodplains. 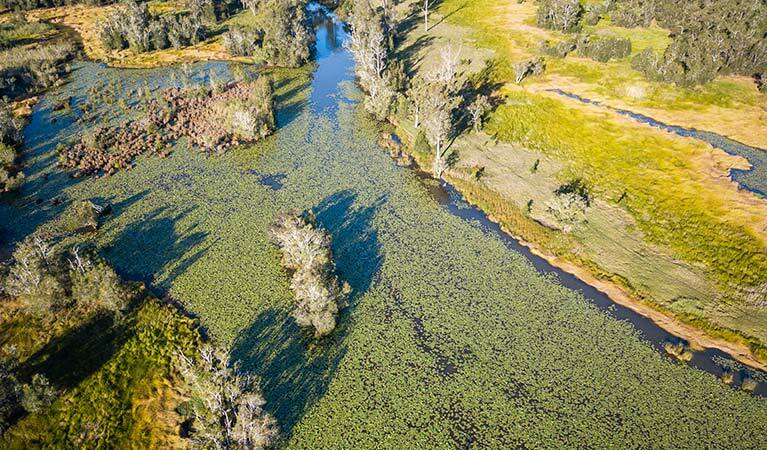 Subscribe to our Naturescapes e-newsletter which is packed with the latest information, experiences and events in NSW national parks. Your next park adventure starts here. Everlasting Swamp National Park is open all year, but may have to close at times due to weather conditions or fire danger.